Since 6 April 2014 many employers have been able to claim the ‘Employment Allowance’ to reduce their employer Class 1 National Insurance contributions (Employers NICs). The annual employment allowance amount is currently £3000. The rules concerning which business qualify and which ones don’t are beyond the scope of Payroll Manager and you should consult the information provided by the government to determine whether or not you can claim this allowance. See www.gov.uk/employment-allowance for more information. How do I ‘tell’ Payroll Manager that I wish to claim the Employment Allowance? How does program handle the Employment Allowance? If you are claiming the Employment Allowance then you need to inform HMRC via an Employers Payment Summary (EPS). If you have ticked ‘Yes, this employer qualifies..’ then Payroll Manager will schedule an EPS for 5 May which you should submit when you are ready to do so. You only need to inform HMRC once per tax year that you are claiming the Employment Allowance, so any further EPS submissions will not include this information. The Employment Allowance does not affect the amount of NIC calculated, it only affects what the employer owes to HMRC. The amount owed is only calculated at the end of each month (or quarter), so you will not ‘see’ the allowance until then. The allowance will not show on payslips or any reports detailing what has been deducted from employees – it will only appear on reports showing what the employer owes. Payroll Manager will automatically calculate the Employers Allowance up to the £3000 limit in each tax year. How can I check that Payroll Manager is claiming the Employment Allowance? 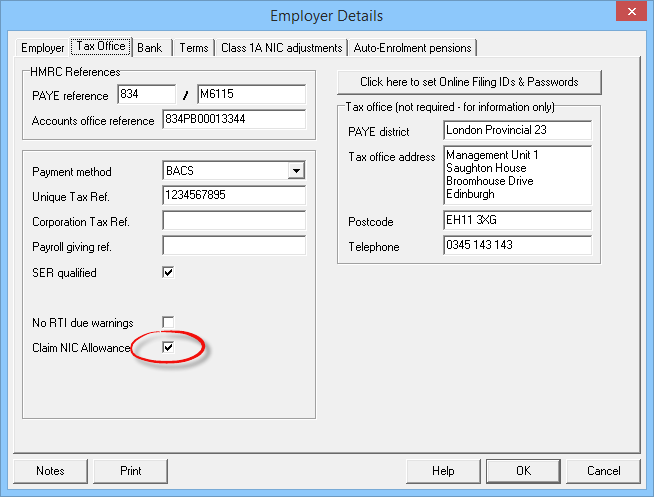 Click ‘Pay – Employers Summary for Tax Period’ (not current period) from the main menu in Payroll Manager. You will see details of the Employment Allowance on this report. The P30 (click ‘Pay – Employer’s Payslip (P30)’) and the P32 (click ‘Forms – Employer’s Payments P32’) also show the Employment Allowance. Note that the P32 will not display the Employment Allowance on a weekly basis as it is only calculated at the end of each month (or quarter if you pay HMRC every 3 months) – see below. What if I can’t see the allowance on these reports? If you cannot see the allowance, check that you are set to claim it by clicking ‘Employer – Employer Details – Tax Office’ and ensure that you have the ‘Claim NIC Allowance’ box checked. I am taking over a payroll mid way through the year and am using the ‘Tools – Mid Year Start’ feature. How do I enter the employment allowance that has already been used up/is still remaining? 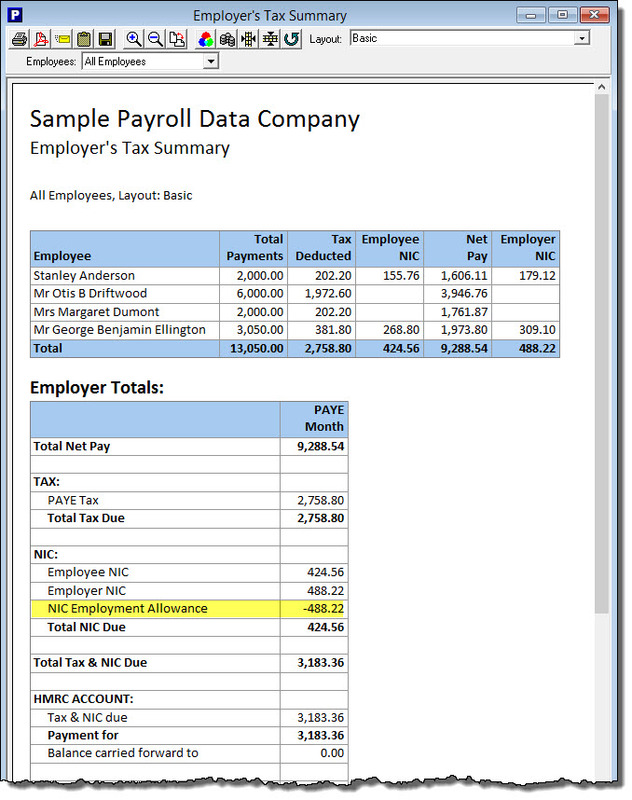 – Payroll Manager is able to calculate this automatically. When you enter ‘mid year start’ figures into the system, one of the fields that you need to complete for each employee is ‘Employer NIC’. 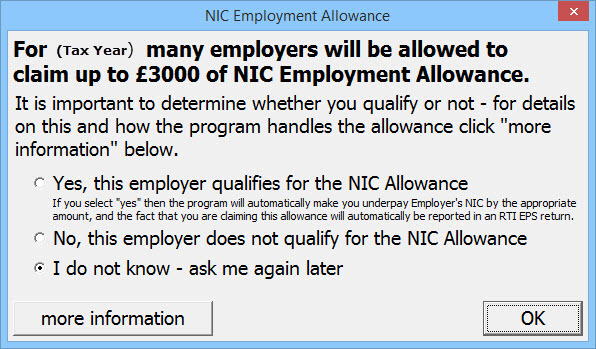 Payroll Manager then calculates the total Employer NIC entered and compares it to that years Employment Allowance (e.g. £3000). From this Payroll Manager can determine how much of the allowance (if any) remains.